Make sure to click the Insert button. You can find it in the upper-right corner of the screen. It is close to the Delete button. After clicking on the Insert / Edit button, you will be redirected to the following screen. The Category Name must be filled with the exact terms that define that category. Ex. If the online store is selling clothes, possible categories can be the following: “T-Shirts”, “Shirts” or “Jeans”. This is the text that is displayed on your site. The Meta Tag Keywords section lets you enter in relevant keywords for this product. Great for SEO but make sure the keywords you use are relevant. The Meta Tag Description field lets you enter in a relevant description for this category. Great for SEO but make sure it is relevant. 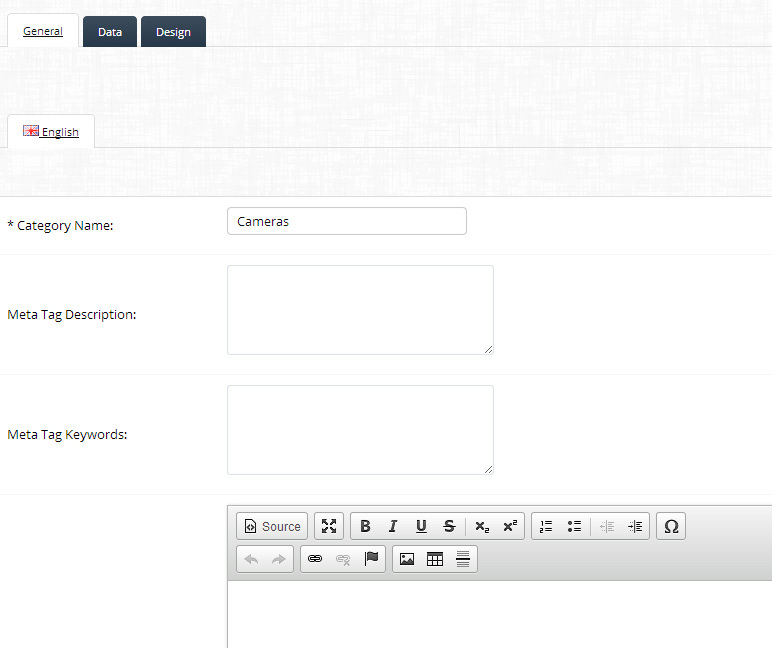 The Description area is made from an HTML Rich Text Editor. This is also a WYSIWYG editor. You can either enter in the text you want displayed (just like you do in word / email applications) or you can insert HTML code using the Source button. The HTML Rich Text Editor helps to write bold, italic or underlined text.